Two days from now, we’ll be witnessing the most awaited grand display of colorful giant hot air balloons, amazing air show of aerobatic maneuvers and formation flights. 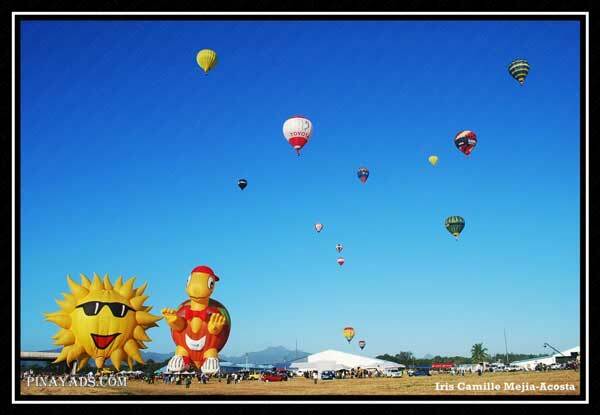 Now on its 18th year, the Philippine International Hot Air Balloon Fiesta will be held on February 21-24, 2013 at Omni Aviation Complex, Clark Special Economic Zone in Pampanga. Get in on the action — fly a kite!. Watch as daredevil paraglider pilots and skydivers float thru the air. And witness (maybe even join) our brave servicemen perform rescue demonstrations. Tickets are sold at Php 250.00 at the gate during the event or thru SM Ticketnet outlets. Take the North Luzon Expressway and exit at Dau, Mabalacat, Pampanga. Follow MacArthur Highway southbound, then make a right to enter Clark Special Economic zone. This is right after the entrance to SM City Clark. Enter thru the main gate and follow M.A. Roxas highway until you see directions into the fiesta grounds on your right. Take the North Luzon Expressway and continue into the SCTEX. The fiesta grounds will be on your right. Take a north bound bus to Dau. Check their websites to find out more about their flight schedule and route.